The game qwhere imagintation matters. It's made of cork, could be used to catch mice and is talked about at parties. Is there such a thing ? It floats, is made of metal and can be given as a gift. Is there such a thing ? It has hair but no teeth, needs fuel and is essentially flat - there's no way there's such a thing! 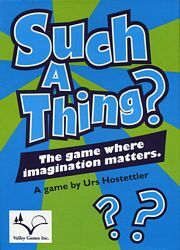 Such a Thing is a card game where you need to think of something that is described by all the cards in play. You add one card to the existing list of qualities in order to empty your hand before your opponents. With each new card, you must thing of a new thing that fits all the cards. With 214 cards every game will be different. The first player to empty their hand and successfully name such a thing is the winner!